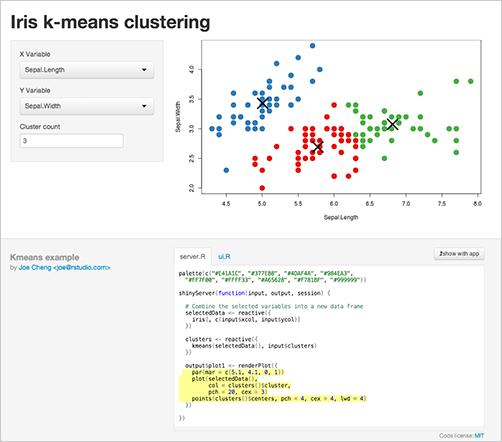 We’re excited to introduce to you our new website for Shiny: shiny.rstudio.com! We’ve included articles on many Shiny-related topics, dozens of example applications, and an all-new tutorial for getting started. Whether you’re a beginner or expert at Shiny, we hope that having these resources available in one place will help you find the information you need. Make it easy to create custom page layouts using the Bootstrap grid system. See our new application layout guide or a live example. Provide navigation bars and lists for separating your application into different pages. See navbarPage and navlistPanel, and this example. Enhance tabsetPanel to allow pill-style tabs, and to let tabs be placed above, below, or to either side of tab content. Create floating panels and place them relative to the sides of the page, optionally making them draggable. See absolutePanel or this example. You can see many of these features in action together in our reimplementation of the Washington Post’s interactive article on Super Zips. 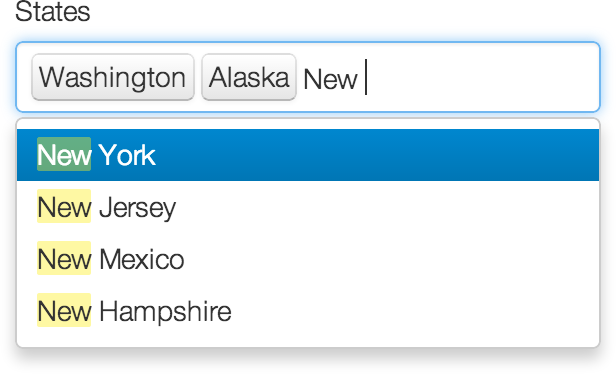 We have integrated selectize.js in shiny 0.9, and selectInput now creates selectize inputs by default. (You can revert back to plain select inputs by passing selectize=FALSE to selectInput.) For more advanced uses, we have included a new selectizeInput function that lets you pass options to selectize. Please check out this example to see a subset of features of the selectize input. There is also an example comparing the select and selectize input. Shiny apps can now (optionally) run in a “showcase” mode in which the app’s R code can be automatically displayed within the app. Most of the Shiny example apps in our new gallery use showcase mode. As you interact with the application, reactive expressions and outputs in server.R will light up as they execute. This can be helpful in visualizing the reactivity in your app. The complete list of bug fixes and features is available in the NEWS file. We hope you’ll find these new features helpful in exploring and understanding your data!